Check your SPAM folder for the manual. Focusing on the Fine details. International, including Canada, orders normally take 2 to 4 Weeks. Import duties and taxes may apply. Please contact us if you would like to make a purchase by Money Order and we will get you setup. See updated video for the Stephen Burns warp nacelle and torpedo tube upgrades. Be sure to view the whole page for many options available. Introducing the release of our Nautilus Engine Soundboard. Please visit this page	to see many of his commission builds. Israel Rosario Robby the Robot Custom Build Service. 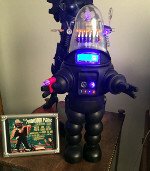 Have a custom 12", 16" or 24" Masudaya Robby the Robot customized for you. Israel now offers our Robby chest flipping switches light effect. See video on his page. Israel also customizes the 16" Masudaya B9 LIS Robot using our B9 2.0 Life Force unit. 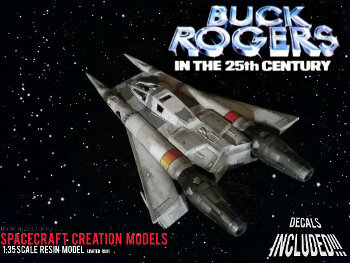 Model builder Danny Attree from the UK offers many awesome builds from automobiles to scifi. Check out his gallery. Exciting B9 2.0 kit featuring everything a LIS Fan could want. All LED kit plugs right into the Moebius 1/6 B9 chest. All LED board that easily plugs right into the chest. Also provides presoldered 0402 LEDs soldered to board for the Bubble. Users can add an optional Mechanical backgroud sound board, optional RC voice activation, and also the capability to add your own phrases if you want to. Available in Black/White or Color TV versions. A Version is available of our B9 2.0 kit which offers Chest Lights only. Low price alternative for those that need a P-N-P install and no need for the voice or bubble lighting. Model Builder Brian Chapman's mini WOTW Diorama. 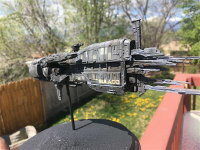 The USS Sulaco From Alien 3 1:2400 scale resin model 13 inches long. Awesome diorama by Geoff Lucier. Why was doctor Smith always allowed to go on doing the things he did? Here are just a few Products you will find by Navigating the buttons on our Left Banner. New 3/2017!! Added 3-3-2017 We've updated our Klingon Bird of Prey with Disruptors and optional engine sounds, The KBOP 2.0 Light and sound kit. See the My KBOP photos and video!! New 10/2017!! Introducing our New Plug-N-Play version. Our popular kit, with the same great effects, is now available in plug-n-play so you don't have to solder. 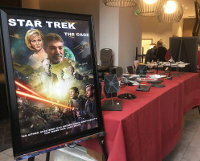 and Monogram TOS Viper that will compliment your TOS Raider. shorting effect, and cockpit lighting. Power Supplies, Decals, Masks and More. All electronics circuits can be installed in your base. Most models that you purchase do not come ready to install lighting kits. 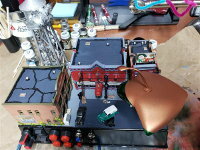 Modifications and some scratch building of parts may be required to install any type of lighting kit. The "WOTW War Machine Life Force Kit" for the Pegasus 1/48 or 1/35 scale model. Our detailed instructions will show you how to eliminate the forward LED hot spots. Enhance your K'tinga with our Gen/2 Torpedo and Nav light kit. See Video by boyd from Trekworks 1/537 AMT K'tinga using the kit. Polar Lights model in video below. We also have amazing kits for the Masudaya 16" and 24". Click here for kit. This is our sister site for Black Powder Enthusiasts, providing lots of information. We also produce several patch lube products for easier cleaning and accuracy.